Perched atop an impressive sweeping lawn and set of stairs that runs down to the lake, Dalat Palace Luxury Hotel (formerly Sofitel Dalat Palace) is a keystone building of the town. Ad Book now! Rates from US$134.92++. Average rating 8.4 from 498 reviews. The scene could be plucked from a Renoir painting or Henry James novel and you can imagine well-heeled ladies and men in white suits playing crochet and boules. Dating back to 1922, Dalat Palace Luxury Hotel is full of creaky-floorboard-French colonial charm featuring Victorian and Art Deco motifs. Enter through the decadent foyer and you’ll spot delightful details such as the reception’s old cubbyhole key holder. The structure and integrity of the building has been kept – a refreshing attitude in a country obsessed with new, modern buildings – and the rooms reflect an early century to 1930’s style. Oil paintings in gilded frames adorn wallpapered walls, soft pillowy duvets top comfortable beds and wooden shutters open to views of the lake. Though the room suffers from dim lighting, the bathrooms are brightly lit and feature an elegant clawfoot tub with brass fixtures. Some modern touches include WiFi, a minibar, flat screen TV and a pod coffee machine. Higher category rooms come with a working fireplace and a big walkout terrace. The hotel has several restaurants, a classic car, spa, gym and Larry’s Bar, a cosy subterranean nook worth visiting for a drink even if you are not staying at the hotel. If you want contemporary and modern, this is not for you; some may find it all too twee. But the quality of location and the prettiness of the grounds are indisputable. 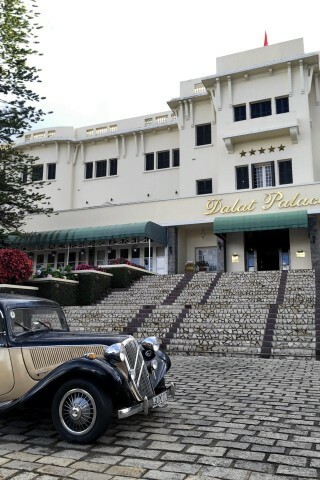 Check rates at Dalat Palace Luxury Hotel on Booking.com. Room: Superior double room, low season: 4,400,000 dong, high season 4,400,000 dong. Notes: Single is 300,000 off.